Asian Finance Research Journal is an academic, open access, online journal that publishes original, peer reviewed research papers. The Asian Finance Research welcomes the contributions from all over the world in the field of Accounting &amp; Finance, and Economic. 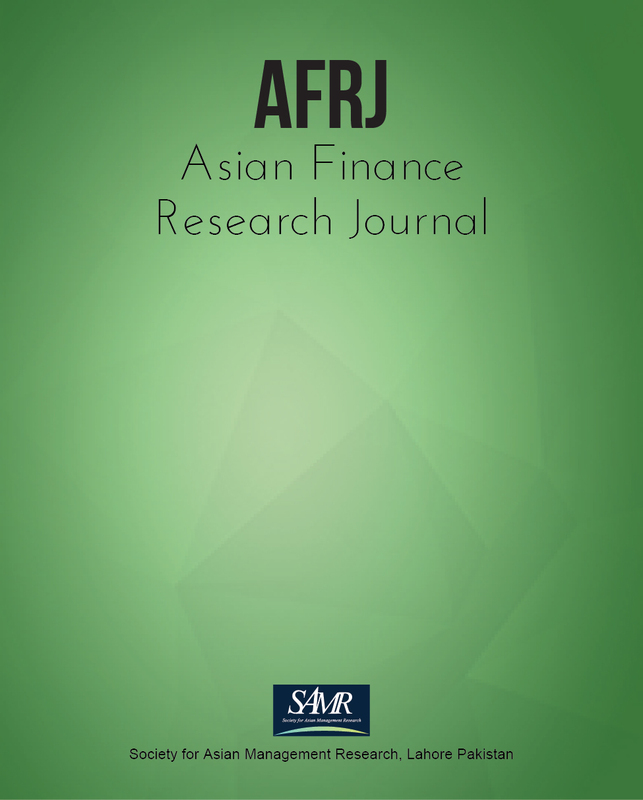 The Asian Finance Research Journal (AFRJ) publishes on quarterly basis in a year. The language of publication is English. AFRJ is an official publication of Society of Asian Management Research (SAMR). It is a scholarly journal that publishes the research on the practices in business management. We welcome both theoretical and empirical contributions from the researchers and practitioners in the field of business management from all over the world. All the submissions must meet the highest standards of research, should adhere to the guidelines provided by the journal and must be of broad interest to the community of business management. The contribution of papers to the existing body of knowledge is assessed before deciding on the acceptance of a manuscript for publication. The journal publishes double blind peer reviewed and refereed articles on emerging business and management challenges that can significantly contribute to the academic and practice domains with sound results. AFRJ is published quarterly and it is an open access journal. Submission of articles to AFRJ means that the author certifies that the submitted article is not copyrighted and it has neither been accepted for publication nor is it under review in any other journal. The author must inform the editor-in-chief in case of any such information. Author(s) must disclose any conflict of interest. Author(s) will transfer the copyright to the SAMR in case the paper is accepted for publication in AFRJ. AFRJ is an open access journal. All contents are freely available without any charges to the user. All the users can read, download, copy, distribute, print, search or link to the full-text of the articles in this journal without asking prior permission from the publisher or the author. AFRJ is a semi-annually both printed and online open access scholarly journal. It publishes blind peer reviewed high quality expert analyses, reviews, case studies, and applied research relating to all disciplines of business management with the aim of promoting the understanding of various aspects of business management among the researchers and practitioners. AFRJ is a multidisciplinary journal, rooted in business management, bridging the gap between practitioners and researchers by providing a combined platform for their work. AFRJ is published by the Society of Asian Management Research (SAMR). All submissions to the journal must conform to the highest standards of intellectual rigour and scrupulousness. The following points give authors a brief overview to focus on manuscript submission and review process. Paper submitted should be original and not under consideration for publication at another journal. All manuscripts should be submitted electronically. Once the paper is submitted it will be acknowledged via email upon receipt. Editorial decision will be made within 20 days approximately. Each paper is reviewed by at least two reviewers. Editors’ decision along with reviewers’ comments will be forwarded to corresponding author as quickly as possible. Our policy is to strive to make a final publication decision after one or two revisions, so authors will have to make revision as per reviews. We appreciate you for considering the Asian Management Research Journal as a publication. We are looking forward to review your research. Thank You! AFRJ is a quarterly online and open access scholarly journal. It publishes blind peer reviewed high-quality expert analyses, reviews, case studies, and applied research relating to all fields of management with the aim of promoting the understanding among the researchers and practitioners. AFRJ is published by the Society of Asian Management Research (SAMR). All submissions to the journal must conform to the highest standards of intellectual rigor and scrupulousness. All files of the manuscript should be submitted as Word Documents (doc or docx file). The files in pdf version are not acceptable. All submitted manuscript should have a length of 5000-8000 words including references. It is the discretion of author(s) to use either American or British English. However, please do not mix both in a single manuscript. Please use present tense as much as possible. Do not write: Jones (2011) stated that…. Do write: Jones (2011) states that…. Please do not use passive voice except in the methodology section. It is recommended that before making the final submission to the journal, ask two of your colleagues to review your article. This will help you to remove any possible grammatical and other errors in the paper. You can express thanks to your colleagues in acknowledgement on the title page. Title of Manuscript: Title of the manuscript should not exceed 14 words. Please submit two separate files. One should be named as Title Page and other should be named as Anonymised Document. Name(s) of author(s) and affiliation(s). Contact Details of the author(s). The Anonymised Documents should not contain any information about the author or its institute as this file will be sent out for the blind review. The manuscript can be rejected if this file contains any information about the author. Each manuscript should contain an abstract of 200-250 words. This abstract should be placed immediately after the title. The author(s) should provide at least six keywords after the abstract. There should be one inch margin at the each side of the paper. Please use Times New Roman font style with 12 point font size. Please make all the paragraphs justified. The first line of each paragraph should 0.25” indented except the first paragraph after heading with single line space. Please number all the pages at the centre bottom of the paper. Please use Footnotes/Endnotes if they are absolutely necessary, otherwise avoid them. All figures (Charts, diagrams, line drawing, screenshots and photographic images) should be of high quality, legible and number consecutively. All the figures should be placed in the manuscript and should not be submitted as a separate file. Tables should be typed and placed inside the manuscript. Tables in the form of image are not acceptable. All the tables should be labelled and numbered consecutively. The explanation of any superscript or asterisk should be given at the end of the table as footnote to the table. There should be no vertical lines in the tables. References should be in the APA style and author(s) should check them carefully in terms of their completeness, accuracy and consistency. The accuracy of references rests solely with the author(s). Bolino, C. M. (1999). Citizenship and impression management: good soldiers or good actors? Academy of Management Journal, 24(1), 82-98. Kacmar K. M., & Carlson, S. D. (1999). Effectiveness of impression management. Journal of Applied Social Psychology, 29(6), 1293-1315. Goffman, E. (1959). The presentation of self in everyday life. Garden City, NJ: Doubleday Anchor. Chapters Hommel, U. (2010). Value-based motives for corporate risk management. In M. Frenkel, U. Hommel, & M. Rudolf (Eds. ), Risk Management: Challenge & Opportunity (2nd ed., pp. 455-478). New Delhi, India: Springer. Akhtar, S. (2007). Pakistan: Changing risk management paradigm – perspective of the regulator. ACCA Conference – CFOs: The Opportunities and Challenges Ahead, (p. 8). Karachi. Allen, F., & Santomero, A. M. (1996). The theory of financial intermediation. Working Paper . University of Pennsylvania, Philadelphia: Financial Instituions Center, The Wharton School. Asian Finance Research Journal (AFRJ) is committed to the academic community; ensuring ethics and quality of articles in publication. Plagiarism is strictly forbidden and the manuscripts found to be plagiarized will not be accepted or if published will be removed from the journal. The author(s) are asked to sign a publication agreement which warrant that the manuscript is original and does not infringe the copyright of anyone. Furthermore, if the manuscript is co-authored; the agreement should state that there was a full consensus of all the authors. AFRJ applies double blind reviewing procedure to avoid any discrimination or conflict of interest. All related parties should involve in the conformance of ethical behavior standards. The expected duties for editors, reviewers and authors are explained below. The authors must ensure that the research and all materials used in the manuscript are original. The authors should submit only their original work and make sure that they use full and correct citations for any already reported material. The author should avoid tosubmit the same manuscript to different journals concurrently. The corresponding author should ensure that there is a full consensus of all co-authors in the final version and submission. Editor should maintain the confidentiality of all information regarding the submitted manuscript and the author(s). Editor should avoid discrimination and ensure that the evaluation of the manuscript is accomplished objectively. The editor behave ethically by not using unpublished materials for own research without written consent of the author(s). The manuscripts received by the reviewers should be treated in confidentially. The reviewer should support the Editor in making a decision about publication status of a manuscript. If a selected reviewer feels unqualified to assess the paper; should clearly inform the editor and ask for excuse. The reviewer should never use unpublished material on own advantage. AMRJ strives to engage the academicians and practitioners from local and international fraternity having special interest in Asian Context. The main focus of the society relates to research issues within the disciplines of Business and Management. 1-km, bhobatian chowk، Defence Road, Lahore, Punjab. Copyright © 2018 SAMR. All right reserved.